My boss at the college theater has been pretty great about telling me I can use any work I do there as blog fodder. Unfortunately, I’m not to great about Getting Around To Things(tm). 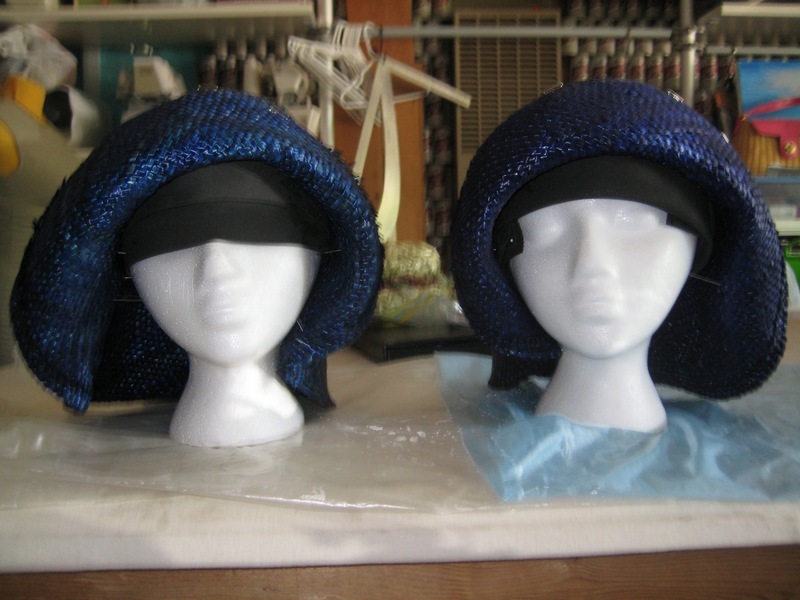 These photos are of the process I used last spring to make the hats for the two female bluebirds in The City Mouse and the Country Mouse. You’ll want to do some basic prep on your hat first. If it has a band sewn into the inside, remove it. Ditto on price tags, decorative elements, etc. Be careful about anything hot-glued on – the glue likes to take chunks of the hat with it when removed, unless you’ve got a very light hand with a razor knife. Sacrificial hats, ready to reblock. I have two because I'm making a matching set. Gently introduce your hat to the bowl of warm water. The straw will become more pliable as it becomes wet, and will start to lose shape. You might have to turn it round and round in the bowl to get it evenly wet. 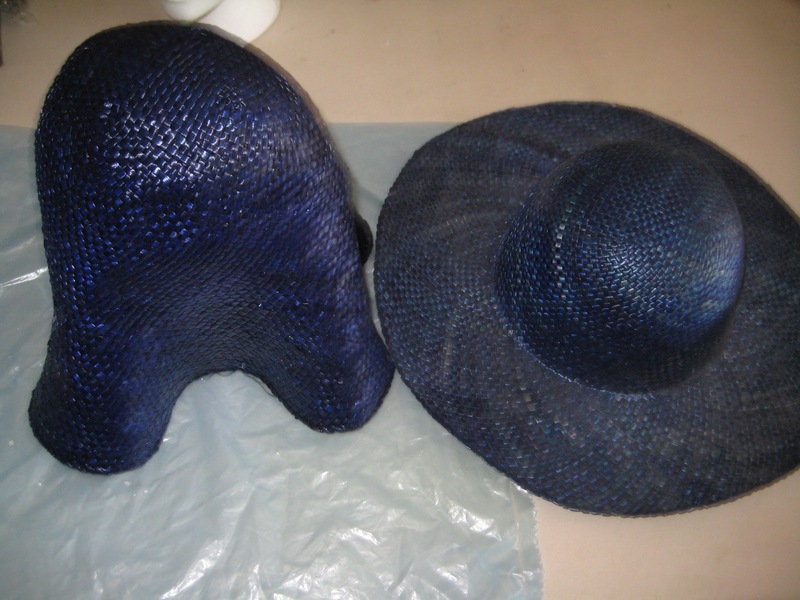 The wetted hat, compared to an original model. 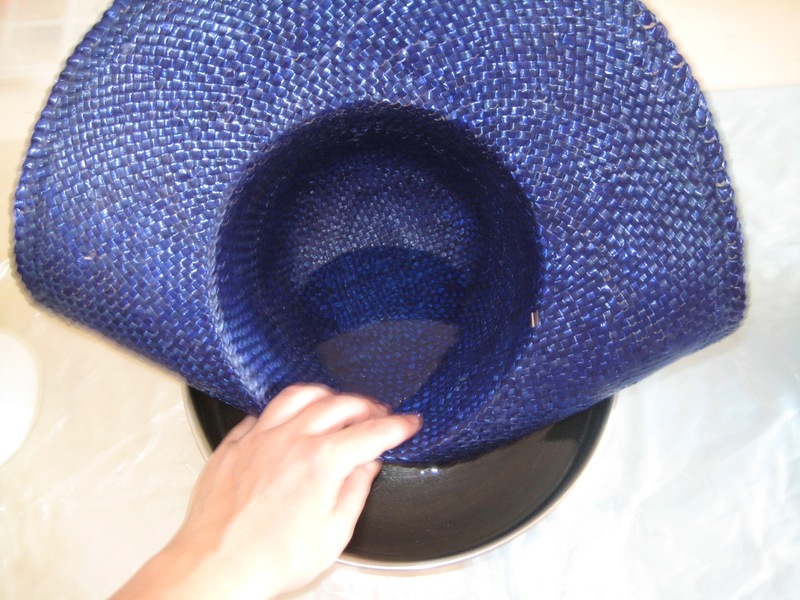 The wetted hat has gone sort of cone shaped, as it was when it was originally woven. This is good, because it's ready to make into another shape. In a perfect world, you will have a full range of sized hat and head blocks at your disposal. I don't, so I'm using a cheapy styrofoam wig head (you can get them at beauty supply stores). It's 22", which is mighty small. I've padded it out with craft foam - just pin it into the head. I don't want to use batting or felt, because they hold water and are too squishy. Try to avoid lumps, which will show in the final hat. The hat must remain wet and pliable for the rest of the shaping, or it will tear, splinter, and generally not become a hat. Place the hat onto the head, and tug gently but firmly until it's sitting evenly like a proper hat being worn. You're stretching the hat to accommodate a head and shaping the crown (top bit) in this step. I find that a sort of thumb-massage motion works well for getting any weirdness out of the shape. Optional, but recommended: you may wish to insert T pins to keep the hat from moving on the head when you start shaping the brim. The pin goes between the straw, not through it! Here's the pair of freshly reblocked hats, drying on the table. Once they're completely dry, you'll remove the pins. Voila! Hat accomplished. It's a good plan to spray the inside of the hat with hat sizing (a highly toxic spray that causes 16 kinds of cancer in Californian lab rats - use a ventilated area). In a pinch, you can use any matte spray sealer inside the hat - you're really just trying to make the straws stick together a little. One last shot of the hats, because I like to show off. And yes, I did airbrush stripes onto the yellow feathers. Cool, right? There’s a couple more things you should know about working with straws. Firstly, it’s really really amazingly super important, not to mention crucial, to have keep the straw at the right shade of damp. If it’s too wet, it’s a bother to work with. Let it dry out too much, and it cracks. I re-dunk the hats in water periodically – sometimes the whole hat, sometimes just the bit I’m currently fussing with. Secondly, there’s a zen to straw hats. They are, by design, entirely woven on the bias. That’s how they work – just like with a bias cut of fabric, if you pull it will get longer and thinner. It you squoosh it neatly, it will get shorter and tighter. (Remember those silly little woven tubes called Chinese handcuffs? Your father might have conned you into sticking one finger from each hand in, then laughed when you tried to pull your fingers out and couldn’t because the thing git tighter the more you pulled, and maybe after a while your mother got tired of the crying and made him show you that you get them off by pushing, not pulling? I mean, not that I speak from experience or anything…. But if I did, I would tell you that straw hats are just like that.) There are some situations where you will find that no amount of coaxing will make the brim on your sacrificial hat small enough to work for the brim you want to have. (Avoid this situation if at all possible.) If that happens, you need to fold the straw sharply where you want the brim to end. The kicker, here, is that you don’t want to break the straw, so be gentle, but firm. As you do this, the straw will tend to want to flare, so you’ll have to keep working to enforce the shape. You can use binder clips (and a little craft foam to avoid marks on the straw) to hold the fold in the edge. 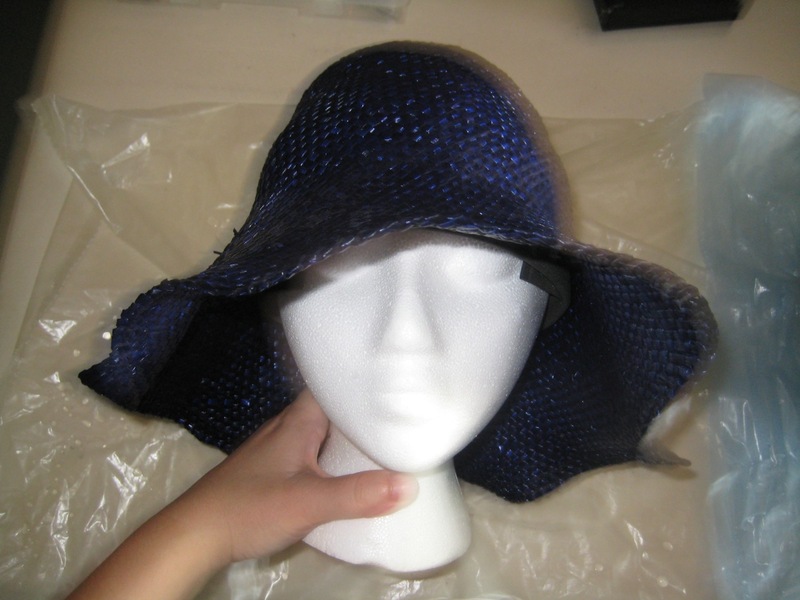 Once the hat is well and truly dry, you’re going to sew the edge, and 1/4″ from the fold, to hold the straw in place. Then you can trim the straw about 1/4″ from the stitches. But really, honestly, you never want to do this. It’s really quite annoying, persnickety, and generally promotes foul language. 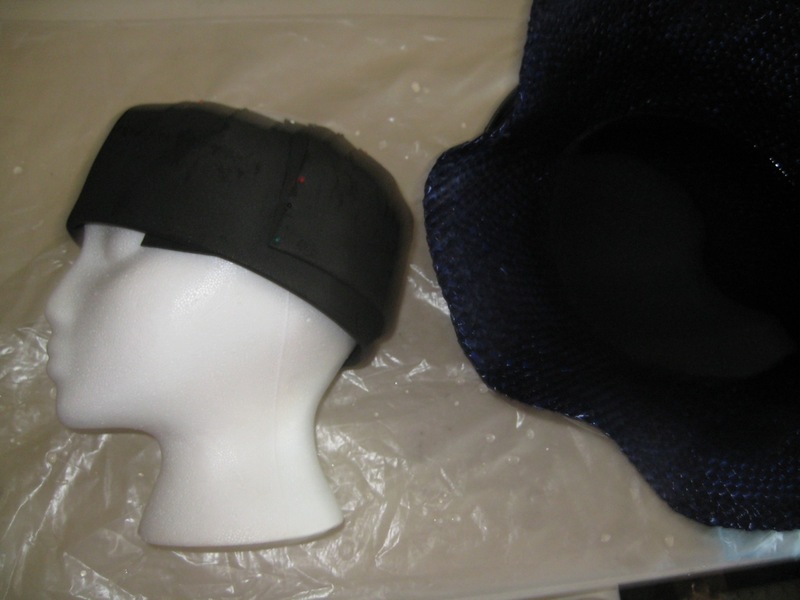 Thirdly, if you need to pad out a styrofoam head, you should use a tape measure and check the size of your own head (or the target head for the finished hat) and make sure that you pad the form out to that size. (Hey, thanks, Captain Obvious!) I mention this primarily because I find it impossible to eyeball this process, and I’m generally pretty good at that. 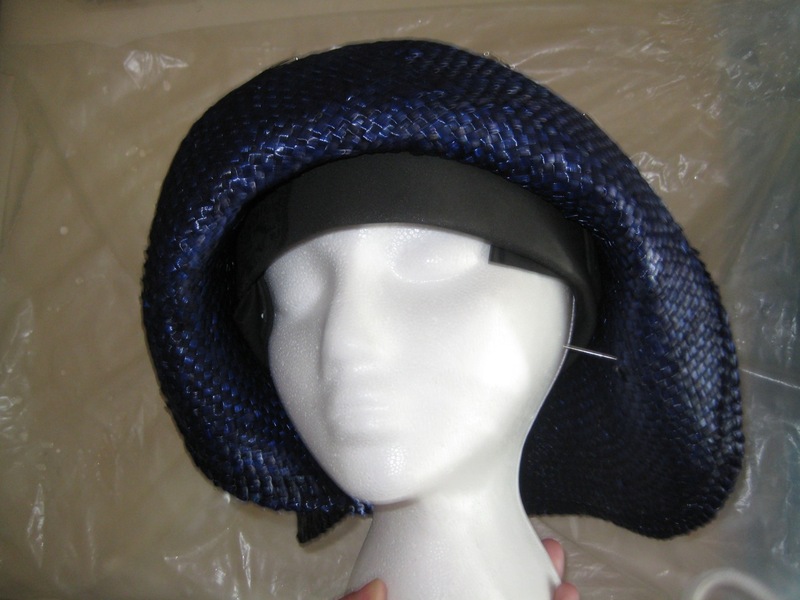 Also, if you’re padding the head out anyway, you can insert something to give shape to the crown – like the top of one of those cheapy plastic hats you get at party stores. Oh, right, and if you’re making a hat for yourself, feel free to block it on your own head. After all, it’s just the size you need, and you probably don’t have to go searching through a cupboard to find it. You might look a little goofy, wandering around with a wet hat on your head, but I’ve done it several times and ended up with perfectly good results. So, I hope this inspires at least a few people to refuse to accept bland, mass produced straw hat shapes, and try making something fun! Previous I Need Knickers, and I Need Them Now! Next I am a Kolledge Gradjee-ate! Hi, I too only have a small hat block. I have found I can make it different bigger sizes by covering it with bubble wrap. You can put on one, two three …. layers to acheive the required hat size. I just simply lay the bubble wrap over the block. This also protects the wood of the block. Hey, thanks – that’s a really great idea! Have you tried this method with felts? 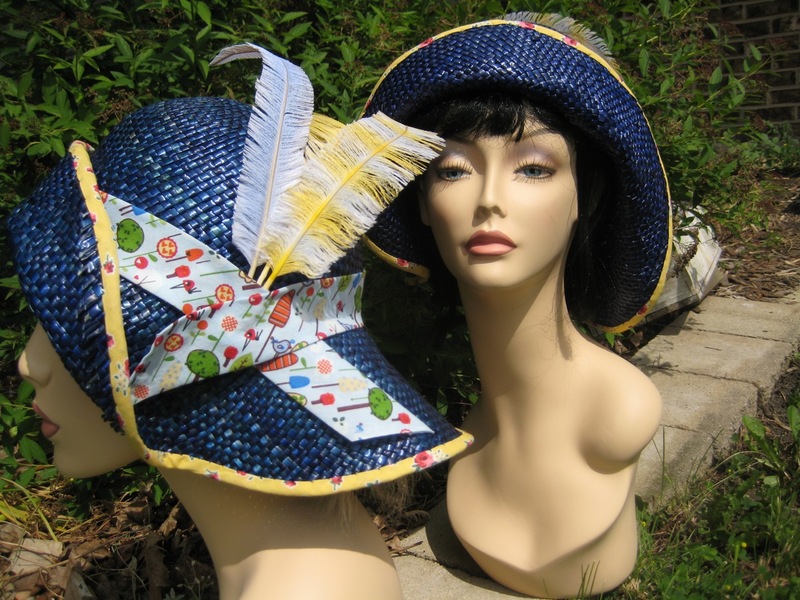 For “real” millinery, I buy straw bodies through Judith M ( http://www.judithm.com/shop/?page=shop/browse&category_id=09eaf256943292b9d4d9eacca6910018 ). For theater and just tooling around, you can usually pick up old hats at a resale (ie, Goodwill) for cheaps. I have a gorgeous hat similar to the one at the beginning. I took it to the beach and unfortunately, it got swept in the tide and it got soaked. It has completely lost its shape and just kind of hangs now! How can I get it back to a pretty “flop” like it once was?! Please help!!! Thank you, you have given me the courage to reshape my new hat. Lovey hats! I was just wondering if it would be OK to cut the straw to shape? 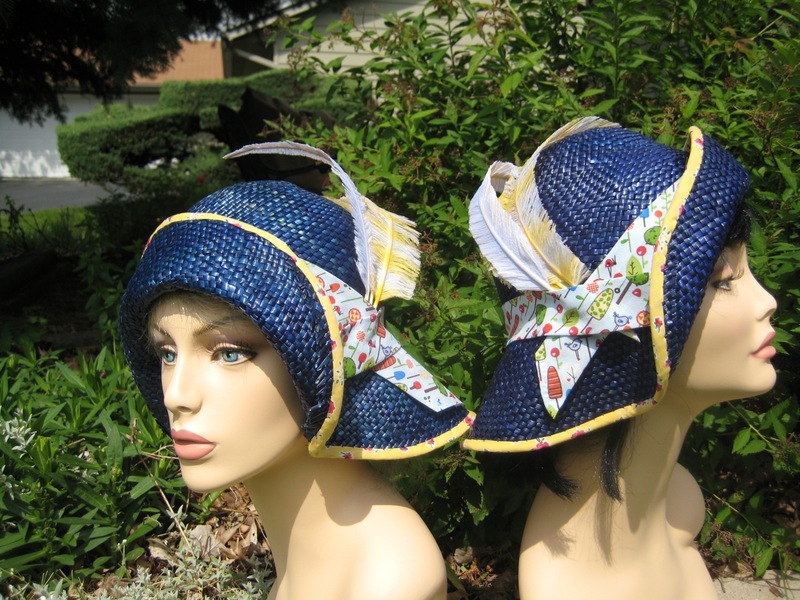 I wanted to make a 20s style cloche, you know, short brim in the back and front w longer sides. I wouldn’t. You’d have to do something to seal the edge so the straw doesn’t fray out. 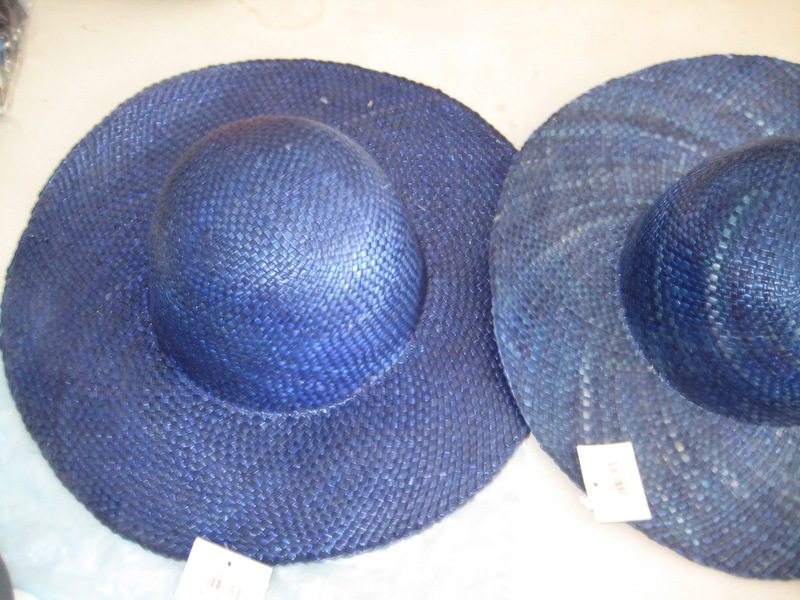 If you have a straw hat that is made of a continuous strip of braid stitched around in ever-expanding circles, you might not be able to do much with it. Cutting and binding would be your best option, especially if it’s the very narrow braid. I have two tricks: run a fine bead of hot glue just inside where you plan to cut to keep the straw together while you work, and immediately machine-bind it with bias tape. If you use a contrasting color, you can make it look fairly intentional. Woven straws are remarkably malleable when they’re wet. You can stretch the parts that you want longer. 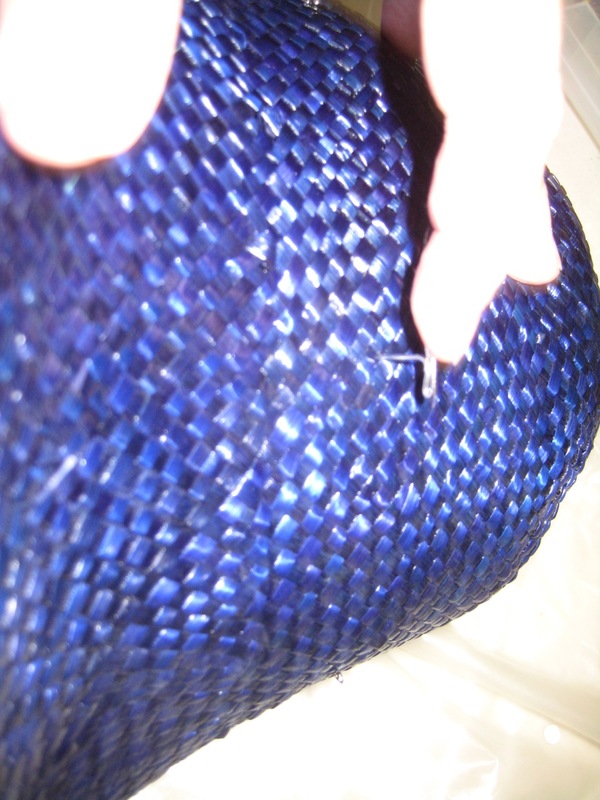 Most or all of a woven straw is on the bias, so as you stretch one area, another will change shape as well. Howdy, Linda – I don’t have a lot of experience with paper hats. My instinct would be to avoid soaking them unless the paper is very tightly wound on itself. But since you’ve had success, when you wet one, you’ll want some sort of form to dry it on. (Anything of the right size and shape will work, whether it’s technically a hat block or not.) Spray starch the inside after it’s dry (or brush on diluted white glue), and that will help it keep the shape. A hair dryer should be fine – remember, you have till 451 F before paper burns. I’d go with an oven on 150-200, but mostly because I am way too lazy to stand around with a hair dryer. You can also just train a fan on the hat to aid drying at room temperature, without the fear of heat making the paper brittle. Let me know how it turns out! Very fortunate that I located the info you have provided. I forgot I had left my raffia hat outside last night & it got very wet die to rain overnight. I will try the methods you suggest to restore it as best I can to it’s original glory.